The last fledgling of March is Tom Sweeney who soloed a Citabria on the last day of March after flight training with Grainne. Here he is getting his shirt cut. Well done to both! Congratulations to Chris Zimmer for earning his Multi Engine Instructor rating from Examiner Shery Diamond after training in a Beech Duchess with Zdravko. We are delighted to welcome Guillermo Sanchez Checa who came all the way from Spain to earn his tailwheel endorsement and build flight time with us. Well done to John Traynor, who earned his Sport Pilot Certificate from Examiner Lou Fields. Congratulations to John and his CFI Daniel. Paul Cianci left the nest! Paul soloed Citabria 1806G, watched anxiously by his instructor Erik Schmidt. Well done Paul and Erik. Congratulations to another of Jerod’s students!. Bonnie Ritchey passed her private pilot checkride in Citabria 5032G. Well done Bonnie and Jerod. Another certified pilot! Jack Liu successfully earned his Private Pilot certificate from examiner Sherry Diamond in Citabria 1806G. Well done Jack and also his instructor Jerod. Well done Brian Myers for scoring 95% on his Private Pilot knowledge test. We are delighted to announce that our own maintenance guru, Al Cermak has been awarded the FAA Charles Taylor Master Mechanic award. According to the FAA’s own Advisory Circular AC65-26C the Charles Taylor Master Mechanic Award is the most prestigious award the FAA issues to persons certificated under Title 14 of the Code of Federal Regulations, part 65. This award is named after Charles Taylor, the first aircraft mechanic, to recognize individuals who have spent over 50 years in the aircraft maintenance profession as Master Mechanics. We could not think of a more deserving guy. Well done Al! Congratulations to Zoltan Gode who soloed Sportstar 917LA after flight training with Dan Most and Jerod Flohr. Well done Zoltan and of course also Dan and Jerod. 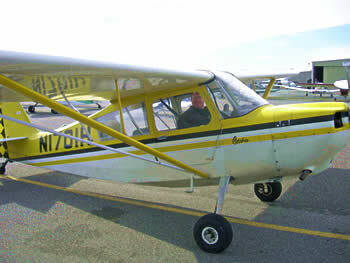 The first fledgling of March is Ed DeBoer who soloed a Citabria after training with Rimas and Jerod. Well done Ed! Congratulations to Bonnie Ritchey for scoring 90% on her Private Pilot knowledge test. 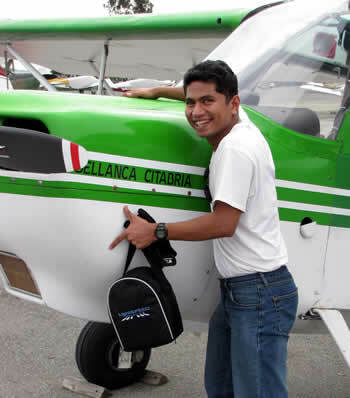 The final fledgling of February (sorry, couldn’t resist the alliteration) is Parik Nadkarni, who soloed Citabria 990WY under Vess’s careful tutelage. No only that, but his wife was watching – no pressure! Kudos to the San Jose State Precision Flight Team who placed third in the regional competition in Salinas, and are going on to the nationals. Here’s a description of what the competition is. You can help with fundraising too as the students receive no money whatsoever from the University, they have to raise it all through their own efforts. The final fledgling of January is Matt Jensen, who soloed Citabria 1701H under Rimas’s supervision. Well done Matt and Rimas. There’s a new Sport Pilot CFI in town – actually he’s going to be teaching in Sonoma. Best wishes to Travis Morton who earned his CFI with training from Vess Velikov. Congratulations to both. Mark Ledwith successfully soloed the Sportstar. Congratulations to Mark and CFI Jim Grant. Congratulations to Bonnie Ritchey and Jack Liu for soloing Citabrias under careful supervision from their instructor Jerod Flohr. Well done to all three. The AeroDynamic Acrobatic Team is taking shape. We have 14 members so far. Jenny Koenig set up a Yahoo group / email list. Anyone interested, please follow the AeroDynamic Acrobatic Team link and sign up. You’ll then get any messages we send out about events, technique, and whatever else, and be able to post your own. The gorgeous weather in the middle of January has had its effect. Two more fledglings are out there flying on their own. Michael Sheehan soloed the Sportstar and Brian Myers flew the Citabria solo. Well done Michael and Brian, and also their instructors Jim Grant and Jerod Flohr. Terry Barwegen soloed again, this time in his own Taylorcraft! Well done Terry and CFI Jim Grant. Another fledgling has flown! Congratulations to James Perry who soled a Citabria under Grainne’s watchful eye. Well done James. Sergey Sinyachkin earned his glider rating to add to his airplane and helicopter ratings. Well done Sergey! Congratulations to Karl Koehler who successfuly soloed a Citabria after flight training with Mark Guerrero. An update from Bob Goodwyn who was a CFI with us for many years. He is now flying as first officer on an ERJ-170 with Republic Airways/Chautauqua/Shuttle America. What is an ERJ-170? – Click here. All the best to Bob. HAPPY NEW YEAR to all our AeroDynamic Aviators!